Primary coach in everyone’s life is their parents, we inherit most of our traits from our father and mother, that’s why I am writing this success coaching for kids article for all the parents who wants to train their kids to be a winner. The life coaching industry has been among the top growing industries recently and the Reason behind this is obvious, that now we have started to realize that our potential is much more than what we can imagine, and by knowing and being open to these deeper truths of our existence only we could create a good and successful life. I stumbled on this very awesome program named “Law of Attraction for Kids“ lately and I did a small research on it, I found out that it could really be among the best investments that people could ever make for the better future of their children, this program will help you to build a winner mindset for your kids. I don’t think that in this age of advancement we could give any other better gift to the kids apart from the ability to think out of the box and create a desired life. We know that the programming of subconscious mind and the set of beliefs are responsible for what we are now, those who have realized it are working on changing those old paradigms and if you are one among those people, you must be very well aware that how much difficult it is to alter these old paradigms. But the minds of kids are like blank pages, it’s the best time to teach them the principles of success. Life coaching for kids by their own parents is what they need to succeed because yet the time is to arrive when schools will start to teach all this. Recently, I had an argument with my friend when the topic of “we are responsible for our destiny” came up. He was arguing to defend his beliefs (which we do very often) and I participated because it was very unfortunate for me to see him living in such deep false strongly held so called “truth”. I suddenly decided to go silent because I became aware that “he will not change unless he decides to” because he is an adult and all his mind’s programming has been done, only he could help himself now. I will not blame our parents for rising us with such convictions, because they gave us the best of what they ever knew, but now we have been exposed to these greater truths and if we don’t teach this to the next generation-they will surely blame us when they will figure it out themselves. Society is filled up with negative beliefs and unfortunately schools are also responsible for this because their focus is still on formal education only- Most important is to teach kids about their true abilities first. Competition, choosing beaten track, working hard, struggling- it is all getting into the minds of youngsters because that’s how society is operating now a days. We should teach them to think out of the box before it is too late. They should learn about their perception, will power, imagination, intuition and all higher mental abilities that they are blessed with. They should know about their conscious and subconscious mind, and the ways to utilize it for their own good. Power of emotions and positive thoughts is what they should learn even before learning mathematics. We should teach them “who they are” before they form an undesired image of themselves in their inner mind. The Secret for Kids is an educational program for children, prepared in order to teach them the art of creating the life of their choice. The program uses interactive books, videos, games, workbooks to teach kids how they could use the creative power inside them to achieve whatever they want, it is presented in a manner that best suits their age. 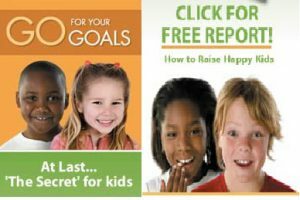 This is a fun program designed perfectly for kids and it comes with three basic books named- “How to get things you want”(this one is for kids aged more than 8), “The secret of making wishes come true”(this one is for small kids) and Go for your goals( this one is a parent guide). I would like you to visit the link (“The Secret for Kids”) and watch the introduction video because it is really is something that you should watch if you have kids or even if you want to keep this knowledge for the future purpose. All I can say to end this post is no matter what we have become, we should plant seeds of growth in the minds of the new generation- let us Make Them Winners!